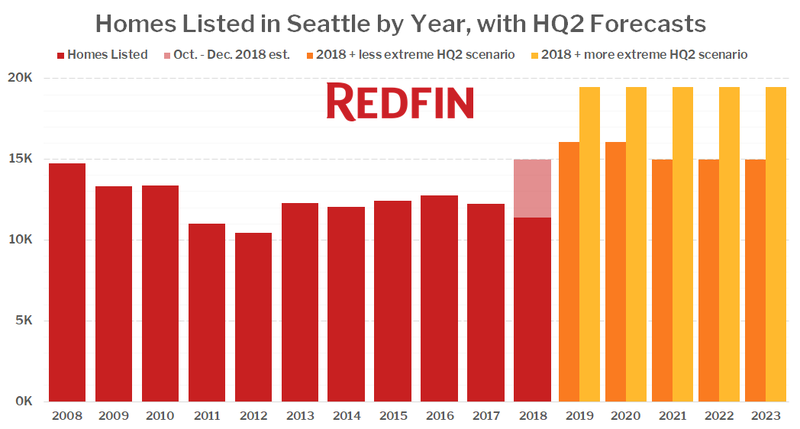 Once Amazon announces the location of its HQ2 and begins hiring there in earnest, it will inevitably slow the Seattle housing market, at a time when inventory is already on the rise and a historic rental building boom is leading to a surging apartment vacancy rate. We touched on it a little in the post, but I think we’re already starting to see these effects in the Seattle area, and HQ2 may be a big part of why Seattle has slowed down so suddenly this year compared to many other markets. Read the whole post over on the Redfin blog. If the slowdown is mostly from HQ2, then why didn’t it start last year in September when they announced it? Instead we had a ridiculous run over the next 6 months. I’d say it’s playing a partial role right now, but there are many other factors contributing as well. According to Mortgage News Daily, average 30yr mortgage rates just hit its highest level at 5.04% today. The last time mortgage rates were this high was in 2010. Perhaps that is the biggest reason buyers are leaving the market due to significantly higher monthly payments. The recent stock market rout did not help either, especially in the high end housing market. This makes me sick to my stomach to say and I’m sure he will make me regret it soon but…. Matt P makes a good point. Interesting; people inside and outside of Amazon have put buying on hold pending this big decision. Pent up demand….. for somewhere, although certainly the outside of Amazon part of it for Seattle. Devil’s advocate: Suppose some here get the tech wreck they are hoping for. What if Amazon has to retrench rather than grow? Or perhaps grow only modestly? If they are committed and paying for even 75% of the space they need, does the grandiosity of HQ2 go on ice? What happens to Seattle housing then? RE: Matt P @ 1 – Agreed. Amazon has what, 40k employees in Seattle? Amazon certainly has a large impact on Seattle but it’s not even close to the impact Boeing had on the region in the 70s. HQ2 is certainly a factor, but the sudden drop-off, imo, has more to do with rising interest rates, changing immigration policies from the Trump administration (which are impacting potential two-earner households where one spouse is a tech worker on an H1B and the other isn’t), and speculative sellers who are dumping flawed “investment” properties to try to catch the bubble before it bursts. The number of current listings on the MLS that are utter crap at this time is just unbelievable to me. Good properties continue to sell easily. I don’t fully understand the extreme worst case conjectures made in the Redfin article. Is Amazon planning to maintain the same head count while moving people from Seattle to HQ2? That wasn’t what I took home from the Amazon HQ2 announcement at all. If anything Amazon is still continuously hiring and taking up office spaces both in Seattle and Eastside. And according to census King county has added 400k in population in the past 10 years, comparing to Amazon’s addition of 40k employees, with a certain amount being local already. Certainly these conversations with would be buyers have validity as they choose to stay on the sidelines. But the fear mongering might have gotten the best of people if Amazon HQ2 is their major fear. At least to me, the perpetual annual increase of property tax by double digit percentage, compounded by reduced income tax deductions, mortgage rate ticking up with no end in sight, influx of new construction inventory without rental price growth would be my choice of reasons to not buy. About 3K+/-; albeit sometimes they ask for far more than they actually hire? I think because that’s only one of many factors, as I’ve discussed before. Higher RE taxes (particularly higher for 2018) and the federal tax law making home ownership less beneficial are probably both factors that have had more of an impact. I don’t remember when the federal tax reform passed, but the RE tax would have started kicking in about April or so. BTW, I ran into one of those people yesterday who are leaving the area because they cannot stand what it’s become, including specifically the taxes. RE: Kary L. Krismer @ 25 – It occurred to me that I shouldn’t just wing those calculations and check what between 10-20% [of October 2017 sales] really is rather than doing the math in my head based on a recalled number. That would be between about 1950 (1953 actually) and about 2,200 closings. That seems about right, but I think it will be closer to the lower number than the higher number, but again very difficult to predict. Well, turns out we’ll likely be closer to the higher number, possibly even October 2018 being almost 90% of 2017 sales (King County SFR). As I mentioned in a prior post, there are a lot of month end closings and it’s hard to predict how large that month end push will be. As a buyer, these are my reasons. I don’t look at the price of the home, I look at the monthly payment, and the monthly payment for places I want is still up 20% from a year ago. This increase is mostly due to taxes and mortgage rates. But also because listing prices are being slower to come down on the lower end it seems. The lower end is still close to Spring prices. But when real estate peaks, that’s usually how it goes. The higher end peaks first and then the lower end follows later on. RE: Brian @ 10 – Just don’t be fooled by the 2019 RE taxes. Just as the 2018 taxes are artificially increased by the McClearly legislation’s poor transitioning, the 2019 will be artificially reduced to correct for that situation–but only for one year. Although as a practical matter, those are just marginal considerations, but in some tax districts the marginal impact is greater than others. For some McCleary was merely a small blip. The latest jobs number means interest rates are going up. Just as we all expected: rumors coming out that Amazon is in advanced talks to put HQ2 (probably really just HQ1 since they’re going to turn into a lobbying company now that they dominate cloud services and online retail) in Northern VA.
Also, Amazon is full of it and everyone is being played if they think HQ2 is going to have 50k while Seattle stays at 40k. Amazon is massive right now and have 40k highly paid workers – what are they going to use another 50k for? 50k x 110k average salary x2 for the actual cost of the employee is another $11 billion in payroll on top of their already high payroll. That’s not even counting the costs of buying up the real estate to make HQ2. Do those numbers even make sense? No, I think we’ll see 50-60k total with an equilibrium between the two at some point which inevitably means Seattle will lose some of its total head count. Maybe I’ll be proven wrong though and Amazon will somehow have infinite growth. RE: Matt P @ 13 – given Amazon’s leveraging power, they can go into a wider range of sectors in a semi disruptive way. Their game isn’t the high profit margin play but market share taking by squeezing to edge out competition . Therefore, doubling their current head count isn’t out of question. Of course they have high profit margin areas in cloud and ad space, Amazon has a plenty of ways to pivot and play the long game. Also, Amazon is full of it and everyone is being played if they think HQ2 is going to have 50k while Seattle stays at 40k. Whatever the numbers, Amazon isn’t going to want to have HQ2 filled entirely with new employees. Some of the Seattle employees will end up in HQ2, probably mainly voluntarily, and probably mainly with incentives. His hubris will be his end. Even though Google and Microsoft have backed out- he’s all in. Seattle citizens have no one to blame but themselves for this. Tax hubris, power trips, creepy politicians. Not necessarily. Bezos is moving to be close to his newest, biggest customer: Uncle Sam. I learned today that Trump’s grandfather made his fortune in Seattle by operating businesses in Seattle, buying land and other things in Snohomish county and Sammamish. I wonder if part of the process is polling or otherwise getting existing employee input on which cities they’d be willing to move to. As I mentioned above, they are going to need a considerable number of existing employees to move just so HQ2 has some experienced Amazon employees, but obtaining that type of information would also possibly tend to show how difficult/easy new recruitment would be like in a particular city. IMO, Kiss Your Lucky Stars You Didn’t Buy In at a Likely Peak Collapse? Soon at a theater near you? I still remain open minded on Seattle RE price growth in 2019; but see a “possible” collapse in the stock market [the Midterm jitters and subsequent recent stock collapse proves it real?] if it translates to higher taxes and not more “Trump Tax Cut Phase II” instead; I’ll repeat myself, kiss your stock heavy 401K profits the last couple years all good-bye [trillions BTW] with imminent Open Border Party elimination of the Tax Cut Phase I]. You can call it “blackmail” by Trump if you support Open Borders….but in a nonpartisan sense, it is what it is….wage inflation [COLA], higher American Stock Values and home mortgage interest increases all simultaneously [IMO] go hand in hand. My Gosh a 7% American Stock Bear Loss in October Alone, wowza! We still see 7% YOY American stock growth averaging data before Midterms’ uncertainty [?] destroyed it. Longterm CD rates have settled and are reasonably stable at a 10% increase YOY….a good sign that mortgage rates will settle at the current levels for a bit too [about 5%]? Don’t buy foreign stocks, they’re crashing YOY with tariffs IMO. Talk about a new paradigm. And rest assured, the CDC contradictory reporting on recent life expectancy decreases is just another wild eyed conspiracy theory against the Open Border Party….LOL….working women are now getting heart disease [worse than men now, ask the AHA] like wild fires spreading lately, have you read? Retire early= live longer whether we admit it or not. Milenial women just want to be stay at home wives with a working hubby by a recent 70% poll BTW. LOL…the house of high priced RE cards is crumbling about us? RE: Kary L. Krismer @ 20 – I’m not so sure that there will be meaningful shift of current AMZN employees from Seattle to HQ2. I know a few senior management personnel and none have indicated that would be the case, nor do they know where the location is. They don’t seem to have inputs on where HQ2 should be, as interested in finding out as they are. Seems most employees Amazon would transfer to HQ2 would be more experienced and therefore higher paid. So that could bode poorly for the local housing market. A new paradigm is definitely upon us. RE: Brian @ 25 – RE: Eddiemaster @ 24 – I’m just thinking for corporate culture you can’t just have a bunch of new people in one new place. I agree with Brian that they would likely be the more experienced, but beyond that it might be seen as an opportunity for advancement for some. The number of Amazon employees out of the market due to these concerns could be quite considerable, and it will probably continue at least until a HQ2 city is announced. It is time for the weekend update on for-sale inventory for KC/SFH. Listed inventory is at a 6 year high, not exceeded since 2012. The King County SFH for-sale listings declined by 245 units from last week to 4476, a number last exceeded last exceeded (same week) in 2012. As usual, inventory peaked on Friday evening. The seasonal droop is in full swing. Again 2018 is drooping less than 2017 same week. There continues to be an elevated crowd of sellers at the exits of the King County SFH market: The SFH absolute inventory level is 1.80x (4476/2489) what it was last year. In other words, there are plenty of choices for this slow season, but high prices continued to make total sales lower YOYO in October. A simple estimate indicates that the absorption rate was some 55-60% lower in Oct 2018 versus Oct 2017. That is an indication that the supply and demand curves have shifted relative to each other, and that buyers are being much more price-sensitive than in early 2018 and 2017. Sellers that are unwilling to list at (or at least negotiate to) a competitive price are likely being ignored by buyers, for the most part. Weekend inventory update, King County, graphical edition. As always, click on link, then click once more for enlarged view. Wow, look at that condo for-sale inventory holding up. If I wanted to make fun of David Lereah (and I do), I might say that Condo listings have reached “a permanently high plateau”. The SFH seasonal droopage is more obvious, but as a fraction of inventory (percentage) it is still less than in 2017. RE: Kary L. Krismer @ 27 – since we are all conjecturing. I still reallly doubt the impact of outflow. Senior employees planted roots and are generally slightly older, therefore more focusing on stability of kiddo’s education and have planted roots locally. The higher up people I’ve known all already traveled a bunch as well so having to move while still traveling a bunch isn’t what would make sense. I see very little reason for them to just unroot and move, especially for Arlington VA… Still I don’t think there would be a meaningful impact to supply side of real estate from HQ2 outflow. RE: Eddiemaster @ 31 – I was focusing more on the buy side–I agree it is too early for it to be affecting the sell side. I was just thinking buy decisions might be put on hold if there was any consideration of moving (or fear of being forced to move). I agree with many of your points regarding senior people, but was thinking more that someone slightly lower might see HQ2 as a potential for advancement (or the ability to get away from a superior they don’t like). Also, with the HQ2 city not being known with certainty yet, perhaps some are thinking it might be a way to move closer “home” if not the actual city they are from. In the tech sector, google, Facebook and others have ambitious plans to expand in Seattle area. It’s very difficult to hire in Bay Area. Those companies and others will more than make up for Amazon. Also, as a senior employee in a top tech company, there is another reason people will hesitate to move to any HQ2: high paying tech jobs are pretty much clustered around Bay Area and Seattle. And people switch jobs every 4 years or so. That’s how you keep your compensation up. When you are making a move with family you want to plan for the very long term and not just your Amazon job. I’m sure Amazon employees in the PNW are very excited to move to the beautiful land of Northern Virginia. They will surely enjoy the colder winters, hotter summers, and housing prices that are almost the same as Seattle. I bet what they will enjoy most is that East Coast attitude that is famous for meshing well with the easy-going types from this side of our great nation. I just did a Redfin search for a 3br/2ba in Arlington and found 21 SFH that are under 700k! Good luck folks! In addition to the high prices in Arlington, the public schools are good awful too. At least SPS has pockets of great schools and the east side has fantastic schools. If Amazon is targeting fresh grads, I don’t think VA is a huge draw compared to some of the more hip cities. Actually, if you want to quickly drive change in elements of your corp culture, a new location w/new blood is perfect…especially if you have an extremely wealthy, founding culture that feels entitled vs continuously earning their spot. A new location far away w/mostly new people – some “old enough” in the culture but not so entrenched that they cannot change to help at start up. This is a common strategy and a smart one at that. Like balancing a portfolio, ensuring you infuse it with new opportunities a fresh eyes and minds to lead. Amazon is reportedly planning on crowning two winners of the company’s search for a second headquarters, according to a report from The Wall Street Journal. The e-commerce giant “plans to split its second headquarters evenly between two locations rather than picking one city for HQ2,” a person familiar with the matter told The Journal. Each location would host roughly 25,000 Amazon employees. According to the source, the decision to have two HQ2 locations is related to the company’s ability to recruit enough tech talent. Splitting the second headquarters would also ease issues related to housing, transit, and other issues. Time to spread the wealth! Austin, Texas has much cheaper land and housing. My guess is Austin will be HQ2a. Many techies from Seattle would be happy in Austin. But Dallas with the huge airport and lots of flat land certainly is possible. New York? Who knows. Arlington, Virgina is much too close in to Wash, DC to be any sort of big site and real operational hub. Might become HQ2b. Crystal City is very close to the Pentagon, but much too cramped although the airport right next door is a plus in some ways. So which will be the 2nd? Arlington as the first is a foregone conclusion. If they’re trying to attract talent, where else would they go? Miami for South Beach, Denver for the mountains, NYC for the big city life? It sounds to me like there will be 1 HQ – Arlington because that’s where the lobbying will be and 2 other cities that employees can pick between depending on where they prefer to live. Austin, Texas has much cheaper land and housing. My guess is Austin will be HQ2a. Many techies from Seattle would be happy in Austin. Exactly what I was thinking. Virginia = corporate/lobbying. Austin = tech development. All the lawyers, lobbyists, spies and Bezos’s private army in Arlington ;-). But Bezos may regret having so many lawyers and lobbyists in such an easily-deposable/subpoenable distance from the US Capitol. Real estate is tanking all over the place. I have said it before but they have to put the new HQ, or 1/2 of it, near DC. Turns them into a constituent of Congress and maybe the President even. Now there are going to be TWO (2) additional HQ2s – in other words – THREE (3) HQS. Bezos is making sure Sawant cannot wave her teet in his face again and yell at him to take his medicine. I went to school in Austin. Austin is a nice place but PLENTY of weirdos there too. Then again, your nuggets don’t shrivel up to the size of a dime if you jump into Town Lake. Sorry pfft, I know the hormone shots caused that to happen years ago. Personally, I’d choose Florida. Bezos’ father was a Cuban correct? I know a woman in Costa Rica who works for Amazon. Move to Florida and you’d have easy access to build out a larger Latin-American presence. I would NOT be excited about living in metro-DC again. What a horrible town. I lived in DC for 15 years and commuted to Arlington for some of that time. DC is a weird place in that it doesn’t feel like it has a style of its own, IMO. Like Seattle, it has many transplants and is essentially a melting pot, or at least a mixing pot. I didn’t enjoy the overall experience particularly until I discovered white water kayaking and the associated outdoors community in the Potomac River upstream of the city. I enjoy Seattle and the optimistic, creative, outdoors crowd more. It would be a burden to live in DC again, even though much of my family still lives there. For this reason, I agree that tech talent will not likely enjoy the idea of moving there, though politically-minded indivuals may enjoy working in the capitol. At the end of the day, Amazon is interested in grabbing the best talent in all fields as it expands its reach. Having one central HQ has benefits, but limits this reach for many reasons. It will have an HQ in every major city in the US if it continues on its current trajectory, so which city is next is less important in the long-run. But since this is the first big division, everything is on hold until the issue is resolved. Once HQ2s are figured out and the various major Amazon departments are apportioned across those locations, I think flow will resume, albeit under new supply/demand factors. Queens N.Y. and Crystal City, VA. It’s on people! HQs for everyone! Both of these choices are right by major airports. They’re also outside the downtown area so commutes shouldn’t be as bad. Queens is about get even more gentrified though. LOL at you calling someone else creepy. Just another dirty comment from dirty david. Enjoy the loss on Tuesday! You’re joking right? I was reading some tweets and every in Long Island City says this will just make the commute even worse. What looks close on a map is not always the case in NYC. LIC is very close to Manhattan at least on paper so that is probably why it’s there. I really don’t know my NYC geography that much I’ve only been there a few times. RE: Market Psychologist @ 49 – NYC for Amazon banking; DC for Amazon Pentagon and K Street lobbying. And Trump was born in Queens. The Big Orange Baby will probably be happy with this. Schumer is a New Yorker too. NYC is an emerging tech place too. RE: pfft @ 51 – I have standing orders/triggers to BUY stocks on the market drop if the Democrats win. Maxine Waters to head the banking committee – RU KIDDING? I’m sure the markets will just love that. And Amazon is still not necessary for the US economy to run – Walmart is. Walmart is HQd in a little town in Arkansas which I visited years ago. Walmart feeds the USA – Amazon does not. That Seattle thought they could go after a marginally profitable company whose internal motto is “Day One” and get away with that is classic Leftist stupid. Frankly, I would laugh my arse off if Bezos made all his Seattle natives move to Long Island. I would laugh til I passed out if he moved them all to DC!!! So, Amazon is moving some future people to Queens (really Archie Bunker’s own Queens?? ) and to Alexandria. In the medium term, say 1-3 years, employment will continue to grow here in Seattle. Yes it will probably plateau afterward, but in the meantime all the other big tech employers are investing here. Seattle is clearly the HQ2 of Microsoft, Google and especially Facebook. The two leases give Facebook another 1 million square feet in the Seattle area, commercial real estate industry sources said. At 1 person per 200 sf, that is another 5000 employees in South Lake Union. With 650,000 sf in The Willows, that is another 3250 employees in Redmond. Total it up and that is roughly 8250 new hires for Facebook alone in the next few years. For those of you who consider yourselves true real estate bears over the next few years, do you work at home in your pajamas or have you dealt with traffic in this town lately? Doesn’t that give you some kind of indication of what is going on? Do you really think traffic is going to get better? Long Island City is close to Astoria which is nice(was there in 13) and is gentrifying so LIC might not be Archie’s Queens. I never watched the show. I don’t usually follow the entry of end or month sales by agents, but I have been this month. It’s amazing to me how few were entered on the weekend, or even on Monday. It makes me wonder how late the late reporting of sales is! There’s been very little change since I last reported. According to the above article, Amazon is going to split HQ2, and place it in both Long Island City, and Crystal City ,which is in a DC suburb of Virginia. Of course – this is all speculation, but if true, will only benefit Seattle and area’s housing market. How so? There probably won’t be any mass migration from Seattle Amazon to the other Amazon locations. Seattle Amazon will still have the largest number of Amazon employees and projects. Thus those who are truly making Amazon their career will have a greater interest in coming to or remaining in Seattle, as the Seattle location will still not only be where the “action” is, but the location with the most opportunities for Amazonians to both advance and transfer within the company. Ever lived through a NYC or DC area summer? I have, and it isn’t fun. Hot, sticky and really unpleasant. Puget Sound has probably the best 6 months of weather in the country starting in May. And while it may rain and be somewhat gloomy during our mild winters, it sure beats those freezing winters that both areas experience. Cost of housing going to be cheaper either in NYC or DC area? Don’t count on it – both areas have very expensive housing costs, and a significant increase of high paid workers will only put upward pressure on their housing markets. Taxes – while Puget Sound has come very expensive real estate and sales taxes, NYC and the Virginia have even more taxes. Virginia has a state income tax, and NYC residents pay both a state and city income tax, that became more expensive with the recent federal tax changes. And with many Amazonians single tax payer filers, they are going to discover that with their upper middle class salaries, much of it will go to various taxing entities. Seattle and Puget Sound has its share of problems. But if the reports are true that NYC and the DC area have been chosen for HQ1/2, many current Amazon employees and recruits are going to think twice about heading to either area rather than the Great Northwest. While there may some downturn in the Puget Sound market (which had to transpire as prior housing increases were not sustainable), the future should be secure. Add all the development by other tech companies in the area, as well the general forecasts for population growth in this area, and we are facing a temporary plateau, or temporary reduction in housing prices, not the great recession that we experienced a decade ago. Furthermore, I don’t know too many real estate investors here besides me that survived the great Boeing crash of the early 70s. But survived we did, and housing rebounded after that fiasco, which had a much greater impact on Puget Sound than any issues that would arise with Amazon these days. Its reported investors are waiting for today’s election results [volume is very low now] and the stability of the current tax cuts? Same with buying a house? Equity heavy 401Ks are in a lot of Seattle home buyer portfolios and depend on the stability of the tax cuts. Tonight we’ll find out if Seattle homes are going up or down in value? This will affect Seattle Real Estate. Soooooo…what is SWE’s election prediction on tax cuts vs food stamps? Globalism vs. Nationalism at the Midterms today? I’m hoping and voting for my pocketbook [no one else will? ], but its a Midterm curse against the incumbent President to likely lose Congressional majority….this time [IMO] its a different paradigm, so I give it 50/50. NYC is expensive and crowded because it’s one of the most popular cities in the world. Of course people are going to want to move there from Seattle. I grew up there and can’t think of many other places I would have rather lived when young and single. There is zero need to drive and the city never sleeps. DC has also come a long way. The city itself is way cooler than Seattle these days although it is obviously not going to be as much as a motivator to leave PNW. I will take the weather on the east coast over 10 days of clouds and rain in Seattle, don’t miss it. Probably the real reason for the Seattle Freeze. Everyone is depressed from the weather. My laid off neighborhood MSFT friend [20 years experience as a Project Manager at MSFT] had a contract job with Starbucks, but the contract is over and so is his job a couple days ago…he told me AMZ is a joke job for a professional….you work like 11-13 hr days [with commute included] in downtown Seattle with 2 hour one way commutes from Kent and the parking expenses will additionally drain your income dry. The closer and easier to commute to Renton warehouse locations is all warehouse jobs. Just the fact of announcing HQ2(s) and having some sort of plan may be enough to jolt the Seattle housing market if Amazonians truly have been waiting. A big difference is we didn’t have property taxes and rents eating us alive back then. The 18% Money Markets were a great life preserver I used when laid off, we don’t have that today either. Many folks think like my laid off MSFT neighbor….the commute isn’t worth the stress and shorter lifespans stuck in a freeway line for hours. 30% of the folks do telework, but 70% don’t. I predict a California type loss of skilled workers in Seattle too as the American families seek lower COLA areas with friendlier freeways without more and more OVERPOPULATION killing us off young. RE: StillASoundersFan @ 63 – Being a more recent residence in Manhattan, I would say that things have drastically changed from your youth. If you talking about singles’ fun, I would say that’s mostly in Manhattan, and some areas in Brooklyn. The weather has worsened with higher chance of natural disasters, regardless of which may or may not be caused by global warming. The Island is much more crowded than ever, and lack of personal space really gets to you quickly. The gentrification of just about every neighborhoods now including even areas of Queens mean less of that cultural characters (not unlike Cap Hill) to the point that it can feel very sterile. As for real estate, it is very expensive on a per square foot basis but not appreciating for resell like what the entire west coast has been experiencing up until now-ish. Compound the lack of appreciation with decreased property tax/mortgage interest deduction, it drives many non-millionaire people to rental, causing rising rent (try 3400 a month for a studio). NYC is a fine place to be if money is no issue, that isn’t quite the case for most Amazon workers yet. For most Seattle residents the thought of NYC may not be appealing, but this is a town where many residents despite big cities. For the general population and especially millennials, I think NYC has HUGE appeal. Having NYC as an option increases possible candidates. Believe it or not, plenty of people don’t want to leave the northeast or East Coast. I’d agree that the HQ3 news is bullish for Seattle. Millenial AMZN workers in Seattle are not going to want to relocate to NY or DC. If it were Austin or Denver, maybe. Or somewhere with substantially lower cost of living like in the SE. The MSFT expansion plan is just that, a plan to date…no purchase proof to date. Old News Sullim4, I wish it weren’t for your sake…. I see a lot of employees relocating to different commuting areas [out of hopelessness for better closer jobs? ], and that’s never good news in this Seattle area freeway parking lot…ask my laid off neighbor from MSFT. Its gonna be a LOT worse commute if this all unravels no matter what [IMO], is that really good news? I see gas is near $4 a gallon [making the relocation clogs worse on the pocketbook] before the Open Border Party carbon taxes and State Income Tax [once they get in power] make it FAR worse? Batten down the hatches Bubbleheads, the OVERPOPULATION hurricane is coming soon at a theater near you? If you’re talking Seattle area I’m rolling on the ground in laughter. If you’re talking a Midwest location like KS….it makes numerical sense. High housing cost is not a big deal for home buyers. When you sell, you will get the money back. High tax is the big killer. The money would be wasted by corrupted government. When home owner sell, no tax money would return. I spend twenty years in east coast. Hot steaming summer and cold slippy winter. Thanks Amazon for leaving. Some new companies will filling the gap. Here’s today’s pictures of the MASSIVE CROWDS trying to vote from long “Trump-like Rally Lines/Crowds”. Trump’s tax cuts actually raised taxes in Seattle by billions due to what he did to the SALT deductions. Keep up SWE. Between the deductions, the Trump tariffs and the constant bashing of Amazon by Trump it’s no wonder Seattle RE is tanking. Just kidding, it’s tanking all over. You Know the Old Definition of “Assume” Seattle RE Will Survive Anyway? When I voted there were people there than usual. More people there in 18 than in 16 for the Presidential. The blue wave is going to be a tsunami. Enjoy! SALT and Seattle Real Estate? But its the Congressional and Senate Seats that are up for grabs in this State…Reichart’s replacement could affect the House GOP majority if Democrat. Washington is not a key Midterm State for the GOP, it never was. It will be interesting to see if cities are going to halve the subsidies they promised Amazon now that Amazon is halving the HQ proposal. Oh wait, Amazon made the municipalities sign NDAs so we will never know what Amazon is getting in return! Meanwhile, Amazon has collected reams of data about what 200+ major metro areas will do for a taste of sweat Bezos. Or They Lack the Intelligence to Move? I was referring to southeast US. Atlanta, Nashville, Raleigh, etc. There is no Senate seat up for grabs. It’s 99% for the Democrats. Trump’s tax cuts actually raised taxes in Seattle by billions due to what he did to the SALT deductions. Other states were hit harder by that than our state because other states have much higher taxes. A lot of people actually benefitted greatly from those cuts, but as discussed previously they made home ownership less of a tax benefit. Oh wait, Amazon made the municipalities sign NDAs so we will never know what Amazon is getting in return! I really doubt a NDA could keep what benefits Amazon actually receives private. That would need to be passed as some form of legislation. Now what Amazon was proposing and possibly what other cities were offering, that could be kept private. If it is true that Amazon is only expanding their presence in places where they already have a huge presence – then I am CALLING a RETURN to HIGHER PRICES in Seattle starting almost immediately. Link. I posted earlier that the SALT hit to WA was $3 billion. And for those a bit younger: To infinity, and beyond!!! And pfft’s blue tsunami (which is what I see in my tidy-bowl-equipped toilet when I flush) will ensure continual and perpetual pink unicorns for all Seattleites, woo hoo!